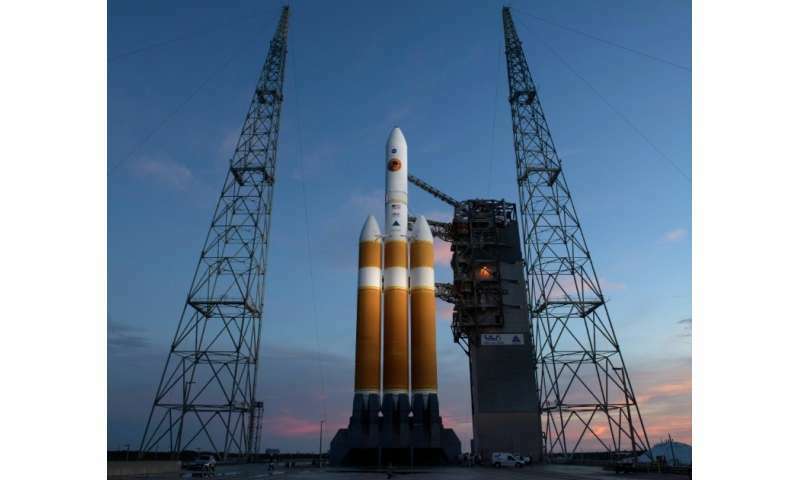 NASA's Parker Solar Probe, which launched earlier this year, has set a new record for becoming the closest human-made object to the Sun, the US space agency announced Monday. "The spacecraft passed the current record of 26.55 million miles (42.73 million kilometers) from the Sun's surface on Oct. 29, 2018, at about 1:04 pm EDT (1704 GMT)," said a NASA statement. "The previous record for closest solar approach was set by the German-American Helios 2 spacecraft in April 1976." The $1.5 billion unmanned spacecraft launched in August, on a strategic mission to protect the Earth by unveiling the mysteries of dangerous solar storms. Its goal is make a series of 24 flybys past our scorching star. The spaceship is "expected to break the record for fastest spacecraft traveling relative to the Sun on Oct. 29 at about 10:54 pm EDT (Tuesday 0254 GMT)," NASA said. "The current record for heliocentric speed is 153,454 miles (246,960 kilometers) per hour, set by Helios 2 in April 1976." Parker's first close encounter with the Sun is scheduled for October 31. Its final close approach—coming just 3.83 million miles from the Sun's surface—is expected in 2024, NASA said.